I was going to open this post by saying “man, it’s hard to believe it’s really been ten years since this show started,” but then I realize, no, I’m pretty sure I felt the slow passage of all ten seasons of this “no tights” (except for all the other superheroes) “no flights” (except for all the other flying superheroes) series about Clark Kent’s meandering journey into Supermanishness. But it’s finally over…a show that, despite its awkwardness, and its goofy plotting, and its overreliance on head injuries, and that whole season about magical tattoos (don’t ask), and its weird vacillating between coyness about being too comic-booky and straight-up giving us Hawkman, still managed to keep me tuning in week after week, partially due to an appealing cast but primarily due to the possibility that Annette O’Toole might pop up on screen at any moment. I did really like the moment Clark finally, finally acquired the power of flight via Jor-El’s “flashback vision” review of Clark’s super-abilities. A bit corny, perhaps, but Superman is always best served with a little corn worked in. Speaking of that scene, Zombie-Lionel-Possessed-by-Darkseid was good ‘n’ creepy. Yeah, I was a little disappointed that we didn’t have full-on Darkseid as Darkseid fighting Clark, but 1) hey, it’s Smallville , why would they start giving people what they want now? – and 2) there’s now precedence for the Fourth World characters moving in our world via avatars (thanks to Seven Soldiers: Mister Miracle and Final Crisis ), but I think we can thank the show’s budget for that decision. Okay, the show’s premise, as originally stated, was “no tights, no flights.” We weren’t going to get Clark in costume because, hey, he’s not Superman yet, and we weren’t going to see him flying, because…it was too superhero-y, I guess? So way back when I figured, when the show finally ended, the final scene would be Luthor about to do something nefarious, when, suddenly, he turns to see behind him (and we see at the side of the screen) a flutter of red cape, and perhaps a boot, and then THE END. Now, had the show only run three or four years, that might have been fine. But the show kept stringin’ folks along for ten years, and during that time we discovered “no tights, no flights” only applied to Clark, as we started seeing more and more superheroes and supervillains pop up who violated both rules. (And even Clark himself took a flight once in a while, kinda sorta.) And I figured, okay, after all this time, surely the last episode will just be full-on Superman action, as a reward for all the folks who stuck around for all this time. I’m not complaining, as such…it’s not as if there’s any shortage of Superman movies or TV shows already, so it’s not as if the world is suffering a loss in potential Superman action. But after ten seasons, I was kind of hoping for more than just…a fluttering cape, and extreme close-ups of Clark’s face while he’s wearing the costume (as shown above), and bits of CGI that were hardly more than what we saw in this flash-forward. But I understand the decision: this is a show, at least as originally imagined, about Clark, not Superman. I still would have liked at least one shot of Clark in the full outfit just as a final payoff, though. And it’s not like they didn’t have Clark in other superhero suits prior to the red ‘n’ blues…giving us a good look at Clark as Superman would have been a nice counterpoint to those other outfits we’ve been having to put up with over the last couple of years. At least we did get him ripping the shirt open to reveal the “S” at the end of the show. So did anyone else think that the Ghost of Jonathan Kent was some kind of projection sent by Jor-El? Especially when he started telling Clark “hey, you need to go back to Jor-El and have him help you out?” I mean, it seems like all the clues are there. Also, I may need to rewatch the series (NOTE: I’m not actually going to rewatch the series) to figure out when Jor-El made the transition from “enemy of humanity” to “tough-love computer dad prepping his son for superheroing.” Wasn’t there a whole subplot about Clark possibly being sent to Earth to conquer it on behalf of Jor-El? How did that get resolved…it’s been so long, I don’t even remember. Okay, back to the finale: offing Tess seemed like an awfully dark way to go with that character, but I guess we needed to reestablish that Lex was a bad dude, or something? And speaking of Lex…I was sure they were going to allow Lex to retain his knowledge of Clark’s powers. The conversation in the burnt-out Luthor mansion felt like it went a long way to establishing an adversarial relationship that would be just between them, and while it was never explicitly stated Lex would keep the secret, it sort of felt implied. Or maybe I was just reading too much into it. But it’s a moot point anyway. The resolution of the “Apokolips drawn to Earth by people infected with the Omega symbol” plot went a different way than I expected as well. Given that Clark can dispel the Omega symbol simply with the powers of Concerned Onlooking and Being Inspirational, as he did with Ollie during this episode, I figured they were leading up to having Clark finally show up in the Superman outfit, inspire the people of Earth with hope in the face of destruction, and thus all the Omega infection would pfffft disappear. Okay, he does say that he can’t do for the entire planet what he did for Ollie, but I thought maybe he was just being modest. Instead, of course, he just flies up and pushes Apokolips away, which doesn’t appear to be any big deal, and all the Omega symbols vanish. Another Smallville -style simple resolution! Maybe I can direct them to these. 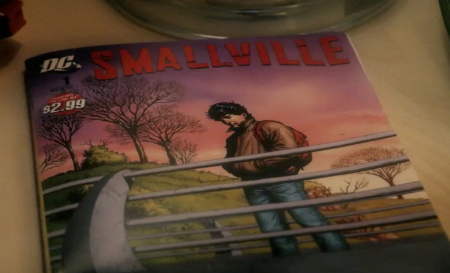 And frankly, that comic’s very existence within the Smallville milieu raises more questions than it answers. So anyway, Smallville …probably overstayed its welcome by a season or five, but I think I’m going to miss it now that it’s gone. …Well, there is that one episode I missed, where Lex marries Lana, which originally aired in the middle of a bunch of weeks of reruns, so I’m not quite done yet. …Is there no escape? So.. Not once throughout it did they say the word “Superman”… Interesting way to do it. Me, I’m just glad it’s finally over. I can’t believe there was a time when I watched this show instead of Lost. Chloe says Superman at the end, when she’s putting her boy to bed in … the middle of the day? Cause when Lois calls it really appears to be the middle of the day in Metropolis. Unless Chloe and Oliver moved to the other side of the planet. And how much memory has Lex lost? Is he still evil? Most importantly how did he get elected president in 2018? Clark looks like Randall Flagg on that comic book cover. Oh, that finale was bad, but entertainingly so. I did like the look of that CGI Apokolips, though. And Jack did get a blink-and-you’ll-miss-it credit in the end titles (which I assume he got every time his Fourth World characters appeared this season?). Not enough homoeroticism between Clark and Lex, though. And yeah, what was up with the 2018 presidential election? Also, you can tell the Smallville people agonized whether they should show a black president or not, and promptly hedged their bets by not showing any of his skin at all. Although it would have made for an interesting sociological statement if the implication was that Luthor succeeded Obama as president. I was very disappointed in the finale. From last week’s episode with that roundtable of supervillains, I expected Impulse and Aquaman to show up too for a Battle Royale ending in a showdown with Darkseid. And the whole on-again-off again-on-but-not-for-seven-years wedding shenanigans seemed like a copout. (much like the uniform shenanigans) Still there was zombie Lionel-nobody plays demented like John Glover. I’ve got the 1st 9 season sets and will certainly buy the tenth but Rao only knows if I’ll ever watch them again. 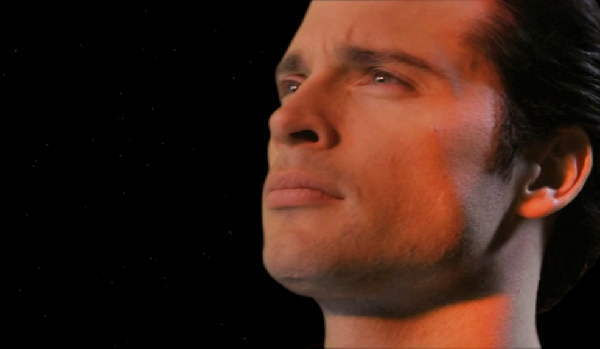 I’ve never watched Smallville before but decided to check out the finale. Man, was it dumb–probably one of the dumbest episodes of prime time TV I’ve ever seen. And this is coming from someone who watched the first few seasons of Beverly Hills, 90210. One thing about the show that always bothered me: I never watched it but would frequently see items about it on the comics news sites. It always struck me as odd that this was a world were Superman was like, the LAST member of the JLA to start his career. After guys like Blue Beetle and Booster Gold! Okay, I don’t like being completely negative so here was something I liked–John Glover was genuinely creepy as Lionel Luthor. I got really uncomfortable when he was pawing his daughter. I still think Darkseid/Lionel looked suspiciously like Alan Moore. The Lex Elected President thing was a nod to en episode early in the series where Clark & Lex met an elderly woman who could see the future when she touched someone’s hand. When she touched Clark she saw a blur of red and blue. When she touched Lex she saw him wearing an all white suit in a field of flowers that died (or something) and he was President. It came on around the time Lex was elected President in the comics. Oh, that last post was in response to “eee-gah” up above. WIth regard to President-Elect Lex Luthor in 2018, clearly “Smallville” takes place in the “West Wing” universe where elections are offset by two years from where they are in our reality. …and they’re used to that kind of thing! Hadn’t watched in years, but watched part of the finale. When Clark apologized to Lex for not being able to save him, he should’ve thrown in a little something about never having tried. Sheesh. I have to say with the expectations Smallville has set over the years, this finale kind of rocked. I was wanting to see more of a JL/Apokolips battle, but I think they did right focusing on Clark becoming Supes. Of course the good/bad transition of Lex was never really handled well, nor the reverse with Jor-El. However, look through 10 years of an average superhero comic and you’ll see the same inconsistencies. Darkseid/Lionel reminded me of Alan Moore also, with the sunken face and eyes and bigger, messier beard. I was a little disappointed with Tess’s death. Her bad/good transition actually was handled pretty well, since she started out more gray antihero than villain. She deserved better. I did want to see more done with Chloe, the best character on the show! Oh how I’ll miss her smile. And those last few minutes in 2018 with all the classic Superman elements in place – that was just awesome. This was one of the worst episodes of any TV show ever. They wasted a whole hour on the “will they/won’t they” wedding BS, then, despite the criticism they got for that wretched “one pinch” fight with Doomsday, they do it AGAIN with a one-punch fight with not-Darkseid. They didn’t even to show a full-on shot of Clark in the suit. Artistic decision? PUHLEEZE. This was a world-class train wreck. Best worst line: “Maybe a hero can’t love.” Ugh. The vomitorium is now open. RIP Smallville, you deserved to go. in 2018 DC’s holdin the line at 2.99. because that book appears to be 4 pages and a cover. hey, it’s Smallville, why would they start giving people what they want now? Gee-zus. That sums up this show in one sentence doesn’t it?